Healthy rivers require clean water. A reduction in pollution reaching the rivers and canals in the Kennet catchment will improve the whole ecology. A team of volunteers monitors the Nitrate, Phosphate and turbidity levels in the catchment as part of Freshwater Watch. We can see elevated levels of both N and P throughout the catchment. Typically, urban pollution increases ammonium concentrations and decreases dissolved oxygen. Major urban pollution events can cause fish kills and have an instant consequence, but often the pollution is low-level and ongoing and comes from lots of small sources. Understanding where this diffuse pollution comes from is critical to ensure that efforts to reduce it are effective. 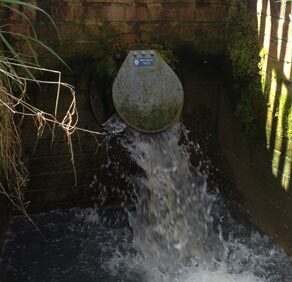 Between 2009 and 2010, the Environment Agency in partnership with Thames Water carried out an urban diffuse pollution study in Newbury. The results from this study showed that the study area suffered from ‘non-surface water’ discharges into the river, due to either sewage inputs or other unidentified pollutants. The study recommended that pollution prevention work needed to be undertaken in Newbury to stop pollutants getting into the river. The whole Newbury Diffuse Pollution Report can be downloaded here. Pollution running off farmland and tracks, and from sewers and septic tanks in rural areas adds to the nutrient and sediment loads in the catchment. 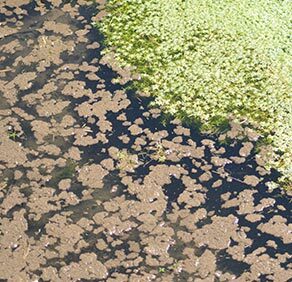 Increased nutrient levels lead to increased algal growth, which smothers the river bed and the plants growing on it. Pesticides, including the slug pellet Metaldehyde, also cause problems in the catchment particularly on the River Enbourne. Sediment washed off fields and farm tracks chokes the clean gravels of the river bed, making them unsuitable for fish to spawn. Catchment senstitive farming is an important tool for helping farmers and land managers to reduce their impact on the river. Catchment Sensitive Farming has been active in the catchment for several years. There has been much activity since then to try to address these issues, beginning with liaison between the statutory agencies, the planning authorities and developers regarding the impacts of boat movements and marina. The river and canal share the same channel at a number of locations, with the first permanent connection downstream of Copse Lock (west of Newbury). Sediments and nutrients in the slow-flowing canal water are stirred up by boats during the summer months. 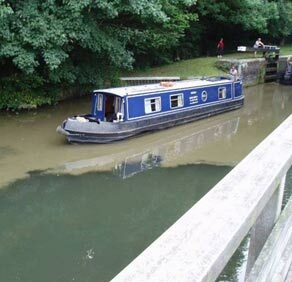 Combined with warmer temperatures this then pollutes the chalk stream where the waters mix. The Environment Agency (EA) investigated turbidity issues on the Kennet over a period of time. 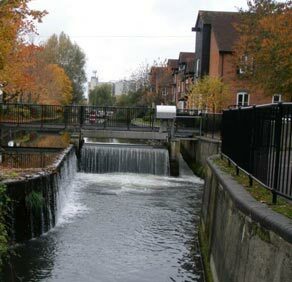 In 2005 the Kennet Chalk Stream Restoration Project (KCRP) was launched by the EA and partners to investigate and address water quality issues affecting the river, particularly those arising from the canal. These sites includes sewage treatment works and industrial premises with discharge consents issued by the Environment Agency to regulate what level of pollution they are allowed to cause. Where the Kennet and Avon Canal joins the River Kennet, dirty canal water enters the relatively clean chalk stream. This is creates significant water quality and turbidity problems. The problem is particularly visible at Copse Lock (SU4167) upstream of Newbury. There is no easy solution to this problem, but a number of measures to improve the quality of canal water are in place, including the construction of bypass weirs, and the Kennet Catchment Partnership is working on a strategy to reduce pollution entering the canal and the River Kennet. A spill of Chropyrifos pesticide into the Kennet in Marlborough in July 2013 is still having an impact on the ecology a year later. Scientists are studying the long term impact of this devastating chemical. See the BBC report here and read about the latest science here. Ideal for schools or community groups, businesses or even as a Duke of Edinburgh project, Yellow Fish is a tried and tested campaign to raise awareness about surface water drainage, which goes straight into the river – not to the sewage treatment works. It was first run in Canada in 1991, but has been widely adopted in the UK. Please contact charlotte@riverkennet.org if you are interested in joining or running a campaign in the Kennet catchment.